Introducing a new series of bright white LED headlights with a genius IQ: The J.W. 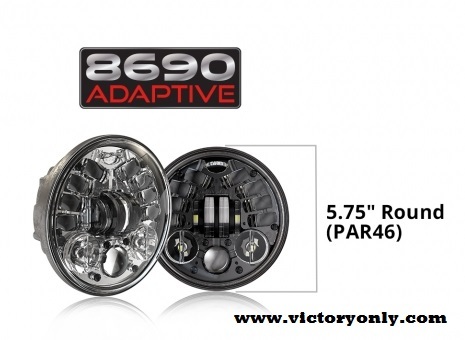 Speaker Adaptive Series™ of LED motorcycle headlights. These headlights know when you’re turning and adjust the light to eliminate potentially dangerous blind spots! Notice shortly after release the new Victory Motorcycle diamond headlight received a temporary price reduction saving $200 from the released price! Victory Only now offers the world’s first dynamically Adaptive Motorcycle Headlight™, designed to address poor visibility while cornering. These new, innovative headlights dynamically fill in the darkness with bright, white light…ultimately making riders feel more comfortable and safe. The Adaptive Series headlights use on-board sensors and advanced electronics to calculate bank angles on a real-time basis, automatically directing the light array up or down as the motorcycle leans. This additional illumination fills the gaps that your stock headlight can’t when cornering at night. This adaptive headlight intelligently “tunes” low beam and banking optics in a way that maximizes visibility in corners. 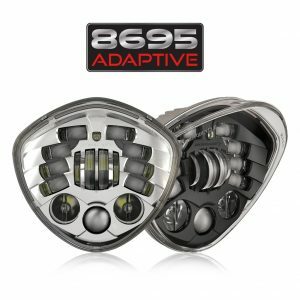 Plug & play solution for 7″ round (PAR56) motorcycle fairing and 5.75″ round (PAR46) bucket mounts & Victory Motorcycles diamond headlights! GERMANTOWN, WI – J.W. Speaker Corporation has expanded its motorcycle headlight offering to include the industry’s first dynamically adaptive LED headlight designed to fit Victory® motorcycles, featuring the diamond shape unique to this application.